V.I.P. (Vagabonds in Power) was recorded live in Berlin, Germany. After an introduction as the greatest thing to come out of Africa, among other things, Fela addresses the crowd and instructs them to see him as “something new from Africa.” Five minutes into the track, the music starts. Fela then instructs the crowd to “Clap with the rhythm so [they] can feel it.” The song builds layer by layer–first the shekere and congas, then the guitars and bass, and eventually the horns. Fela leads the call and response horn arrangement with his soprano sax being echoed by the thunderous Afrika 70 horn section. He sings about leaders who misuse their power and steal from the people and the Berlin crowd gives him a warm reception. 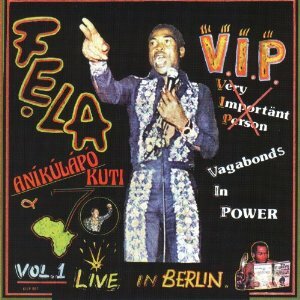 Tags: Authority Stealing, Fela Kuti, Knitting Factory Records, V.I.P.